What image comes to your mind when you think of Mumbai? I bet, it would be of Bollywood, and its glamour and glitz. What if someone asked you about the places to visit in Mumbai? You’d probably think of the Gateway of India, and may be Juhu and Chowpatty beaches. Did it every cross your mind that there might be a lot more interesting places in the City of Dreams than just these? Well, there are, and in fact, loads. Mumbai is a city where the natural and the man-made, and the ethnic and the colonial co-exist in perfect harmony. Which is why, on one hand, there is the lush Sanjay Gandhi National Park, while on the other, are its sky-touching buildings. But, the places we are going to talk about in this blog are perhaps among the least explored…its churches. Yes, the city is home to amazing churches that are not only aesthetically appealing, but also reverberate with calming peace. 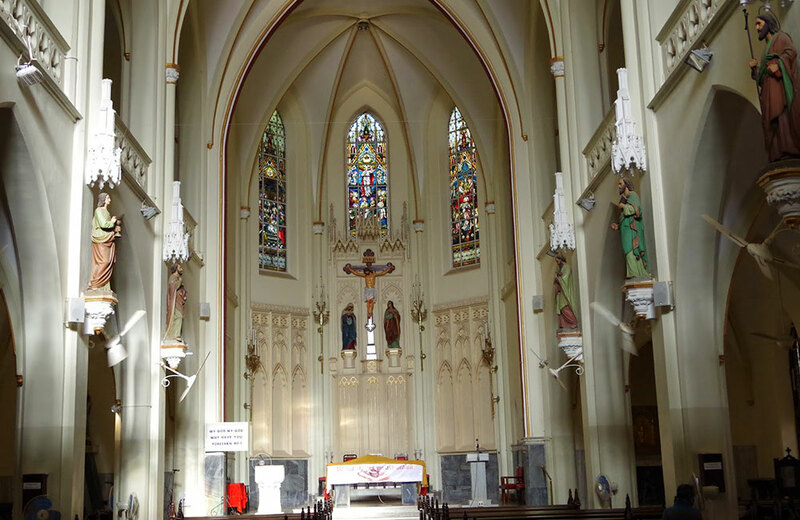 Officially named, Basilica of Our Lady of the Mount, Mount Mary Basilica is perhaps the most colonial-looking among the top churches in Mumbai. Its Neo-Gothic style closely mirrors the architecture of several historical places in Mumbai like Chhattrapati Shivaji Terminus and the High Court building. A brown brick building, it has typical pointed arches along with two towers, each crowned with a Latin cross. Corinthian pillars with beautifully carved capitals, high round-arch ceiling, bright blue walls, black and white chequered floor, vibrant painting sand rather detailed Last Supper sculpture are its primary highlights. Further, you will love the stunning main altar under a ribbed-vaulted ceiling with a statue of Virgin Mary on a seven-stepped pedestal. Built between 1512 and 1585 as per various accounts, St Michal’s Church is the oldest Christian house of worship in the city. It suffered some damage during the invasions of 1687 under Mughal emperor, Aurangzeb, but was soon renovated. The modern building was constructed in 1973 after its porch collapsed in 1960s. 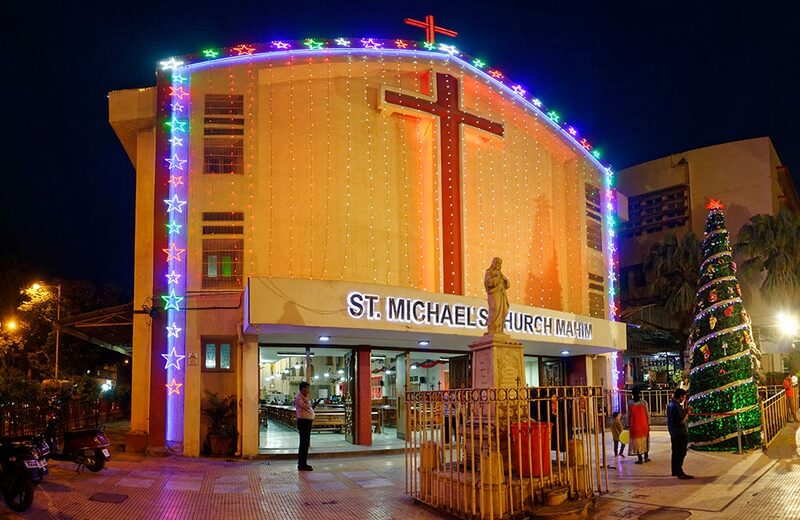 It may just be a simple white and red building, devoid of ornamentation, but what this famous church in Mumbai lacks in aesthetics, it more than makes up for in the peace you’d feel inside. This is the very church where people saw a picture of Christ bleeding from the heart in as recently as 2008! No wonder, it appears at the top of a comprehensive list of churches in Mumbai. Though dating back to just the 19th century, its architecture is reminiscent of an artistic movement prevalent much earlier, the Romanesque style, something you’d find in a place like Pisa. A statue of Christ the Redeemer in the front welcomes you to a building decorated with arches and glass paintings. Its resplendent Gothic altar is flanked by angels sculpted from marble. 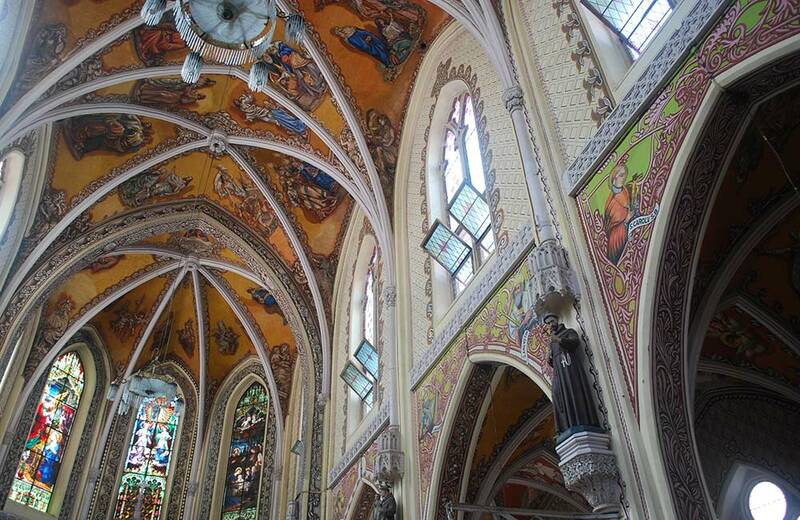 In all, the church is rather airy with a rounded ceiling and detailed floral motifs on the wall. 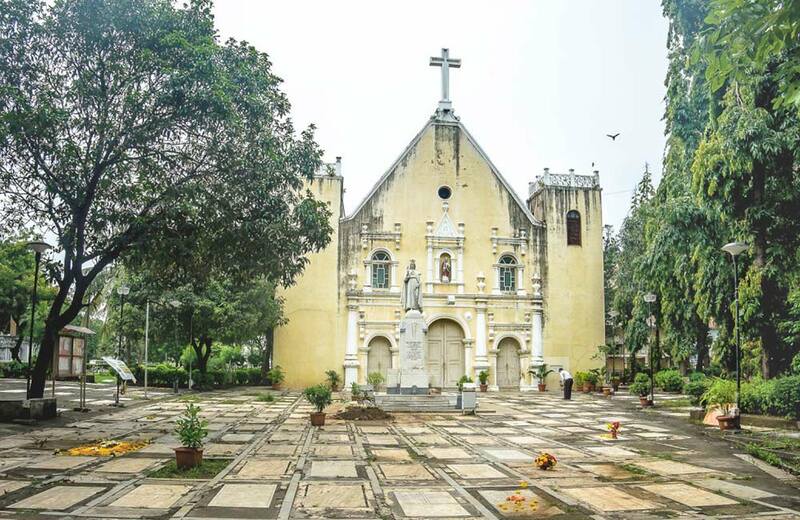 You can even sit under trees as the church is enveloped in immense greenery, providing some much-needed relaxation in Mumbai’s hot and humid weather. Opened in 1905, this is, if you ask me, the most stunning church in Mumbai. It is yet another Gothic building with pointed arches, flying buttresses, and conical-topped towers that look more like a castle built in Medieval Europe. But, step inside and you will realise why I hailed it as the best church in Mumbai as far as the ornamentation is concerned. Its high ribbed-vaulted ceiling brimming with colourful frescoes, pillars with statues on their capital, geometric designs on the wall that had me fooled into thinking those were wallpapers, and stained-glass windows make you feel like you are walking through an Italian city like Venice! Another thing which catches the eye is its white marble altar, which enshrines three life-size idols of Jesus. Come here during the Mass to hear the iconic pipe organ fill the naïve with soothing music. Also called Our Lady of Glory Church, Gloria Church was initially constructed by the Franciscans, who had come from Portugal, in a style reminiscent of their land. 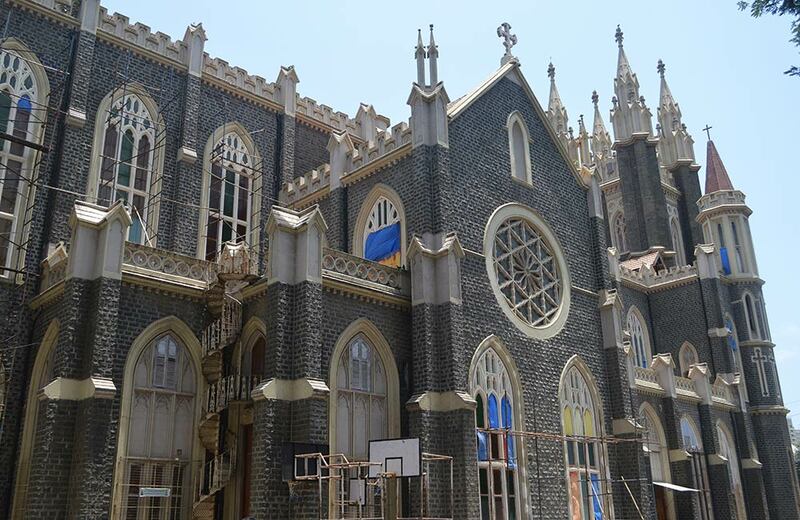 But, this church in Mumbai was later rebuilt as the Victorian Gothic building you see today. Even if you don’t know where exactly it is, don’t worry as its high towers can be seen from quite a distance. The first thing you see when you come here is a marble statue of Jesus, inviting you inside with open arms. If you have by any chance seen Amar Akbar Anthony or Rockstar, you would instantly recognise this church. Its interiors are mostly white, with statues of saints atop pillars and colourful stained-glass windows adding to its visual appeal. Another among the 16th century churches in Mumbai, this one was built by the Portuguese. Walking down a chequered courtyard, you find yourself in front of a statue of the Virgin Mary. Just beyond it is a building which looks rather simple, with plaster almost coming off the walls. But, don’t walk away from its unadorned exterior; rather, walk inside. 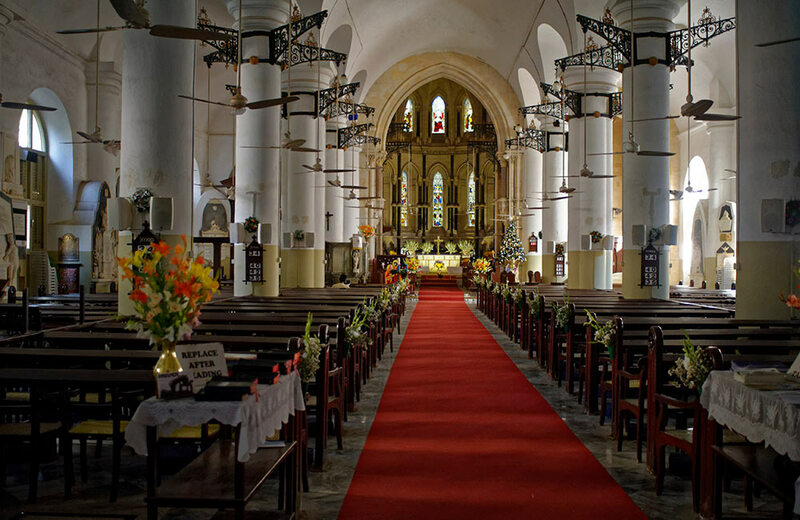 Among the biggest churches in Mumbai, it is rather grand on the inside with golden and red being the major colours used in the altar, which sits under a high round-arched porch. Our Lady, Sacred Heart and St Andrew are enshrined in the altar niches along with Bom Jesus, St John the Baptist and St Sabastian. While here, remember to see the wood hangings depicting the Assumption of Mary and Resurrection of Christ along with quirky quotes put up by the church. 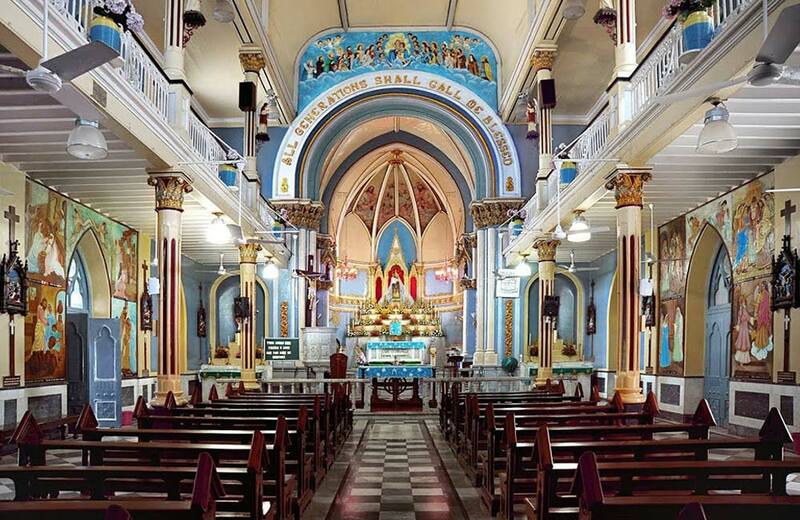 First built in 1718, this is one of the largest churches in Mumbai. It might not look much from outside, but its altar surely is an emanation of the grandeur Gothic architecture is known for. Its stained-glass windows, brick red floor tiles with geometric patterns, stucco work on walls and high ribbed-vaulted ceiling draw your attention at once. Also worth seeing here is a memorial to Reverend Thomas Carr, who served as the first bishop of Mumbai. Did you know that this it was this building which gave the Churchgate station its name? So, when you come here, you are not only visiting a place of worship, but also walking through the heritage of Mumbai. Afghan Church? “Huh?”, you might exclaim, and you are justified, for how would a church be part of Afghan history? Well, don’t be any more as ‘Afghan’ is just a reference to the fact that it was built to commemorate the sacrifice of those who died during the First Afghan War of 1838. Officially named Church of St. John the Evangelist, it is easily recognised by its 198-feet high tower. Its Gothic pointed-arched gateway reminds me of Notre-Dame in Paris; only the latter one is a lot more decorated. Inside are colourful stained glass windows, and floor tiles with geometric patterns brought all the way from England. If you want to just sit in a church and peace out, St John the Baptist Church is perfect for you. But, it has a catch. 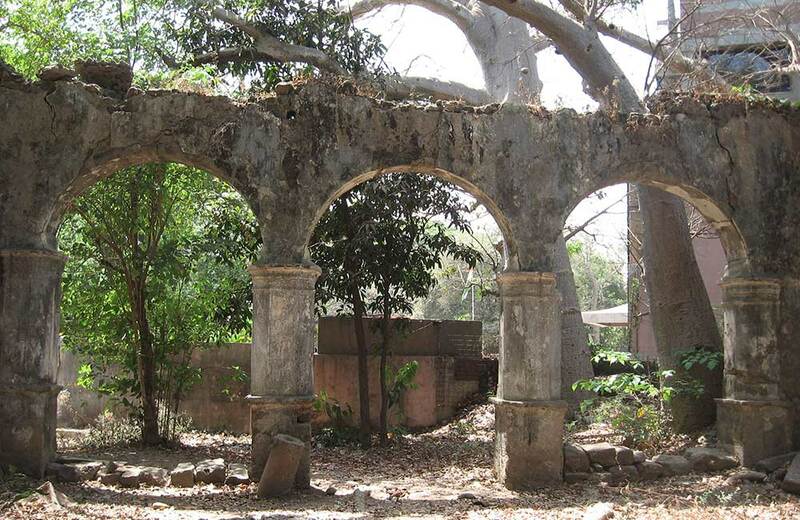 Built by Portuguese Jesuits in 1579 and abandoned after a plague in 1840, it is said to be one of the most haunted places in Mumbai! Yes, you read that right. Many believe it was haunted by the spirit of a young bride, who killed herself or was killed, for nearly 300 years, and only after an exorcism was performed in 1977, was the ruining church finally rid of her. Those who dare to come here will see what is left of its round-arched gates that lead to what would have been a pillared hall. With greenery creeping up everywhere, it is a treat for the senses, especially the eyes. 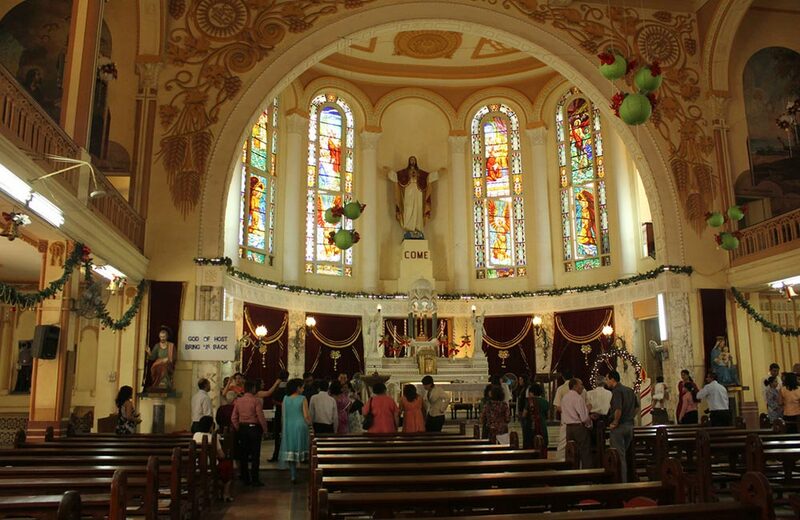 While most churches in Mumbai have European ties, this one is Asian in its origin. It was originally constructed by an Armenian woman in 1787 as a small chapel, on the foundations of which a proper church was erected in 1881. The church is simple in decoration, yet grand in appearance. Resplendent in white, its marble interiors are accentuated with by miniature statues atop pillars crowned by richly decorated Gothic niches as well as by stained-glass windows. Above the altar hangs a sculpture depicting the Crucifixion, flanked by smaller statues on either side. So, now you know Mumbai has another side, way beyond what makes it the City that Never Sleeps. Similarly, there are loads of temples in Mumbai as well that give you a peek into the beliefs of locals. 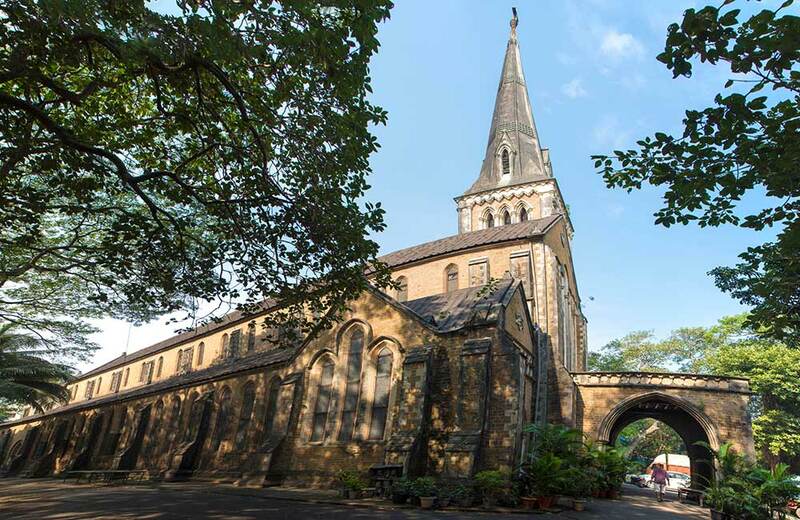 The next time you are searching for places to explore, but do not want to visit the markets and popular malls in Mumbai, head to these churches. Wondering what else is there to see in the city? Read all our blogs on Mumbai and find out for yourself. There you go…Explore the megacity today!